Whether you are looking for a dragon accessory to enchant your world, or are just looking for a lovely fingerless glove pattern, a crochet pattern may be just the thing. These gloves feature a beautiful shell stitch that will hold in the warmth all winter long. This pattern is recommended for an intermediate to advanced crocheter. This pattern utilizes a stitch called the crocodile stitch. There are a variety of techniques for this stitch. For better clarification, use this tutorial for this pattern, which includes steps and photos. To print the pattern for your personal library, click on the photo below. You can also find additional help in downloading and printing the PDF pattern in this Guide for Adobe Printables. Most crochet patterns can be altered for fit or customized to personal preference. These gloves are no different. Browse through the suggestions and tips below to make your dragon gloves a one-of-a-kind creation. If you need to adjust the size after checking the gauge, changing the hook size is recommended. If there is a drastic change in size, increase or decrease the beginning chain in multiples of three. For an all-over dragon scale appearance, continue the crocodile stitch rows throughout, omitting the shell stitches. Note: Increasing crocodile rows will require more yarn. A solid yarn color was used in the pattern example, but variegated, ombre, and tweed yarns will create beautiful shaded scales. 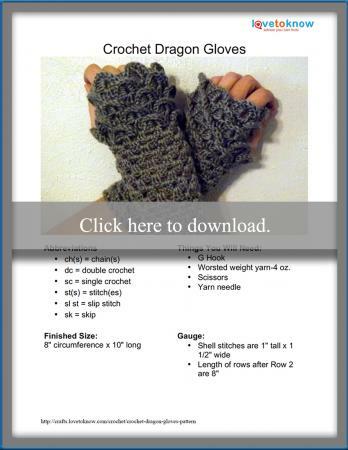 Bulky yarns are not recommended for these gloves as the crocodile stitch layers will make the gloves too stiff. Sport or baby weight yarns are wonderful for a soft thin texture. If using any of these yarns, you will need to adjust the beginning chain in multiples of three. For an added bit of bling, consider sewing small beads or sequins to the tip of each crocodile scale. While the crocodile stitch may seem complicated at first, once you have mastered the technique and finished the crocodile rows, you will be surprised at how quickly this pattern works up. Don't stop at just one pair. This is a great pattern for gift-giving. Make several to give as Christmas or birthday presents for family, friends, and co-workers.